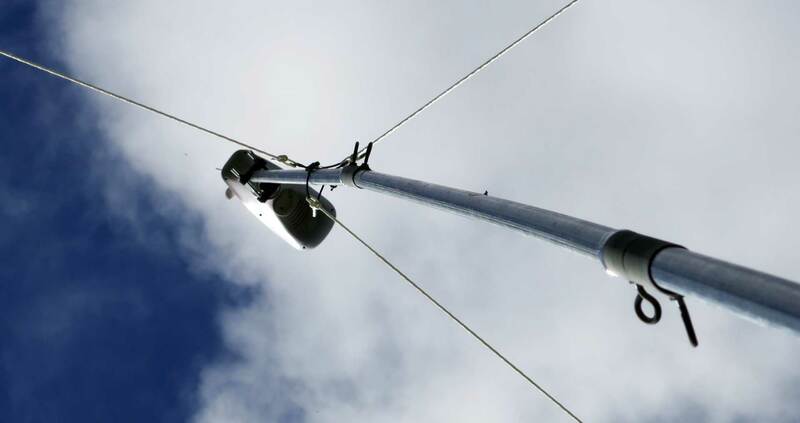 Today, we hoist­ed our Ambient Weather WS-1400IP sen­sor unit atop it’s mount­ing pole. 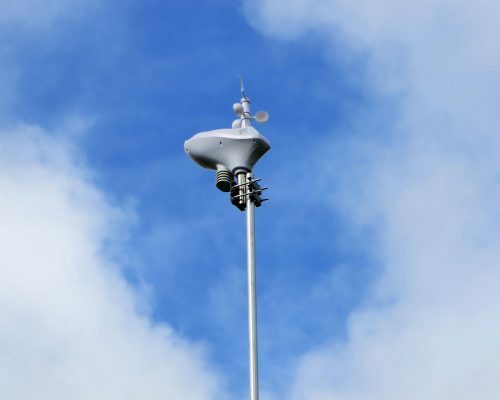 I’ve always want­ed to keep our own local weath­er data, and with the addi­tion of this device, we are offi­cial­ly col­lect­ing data and shar­ing it on the net. We’re still work­ing out some of the details, but this is a excit­ing devel­op­ment as far as I’m con­cerned. 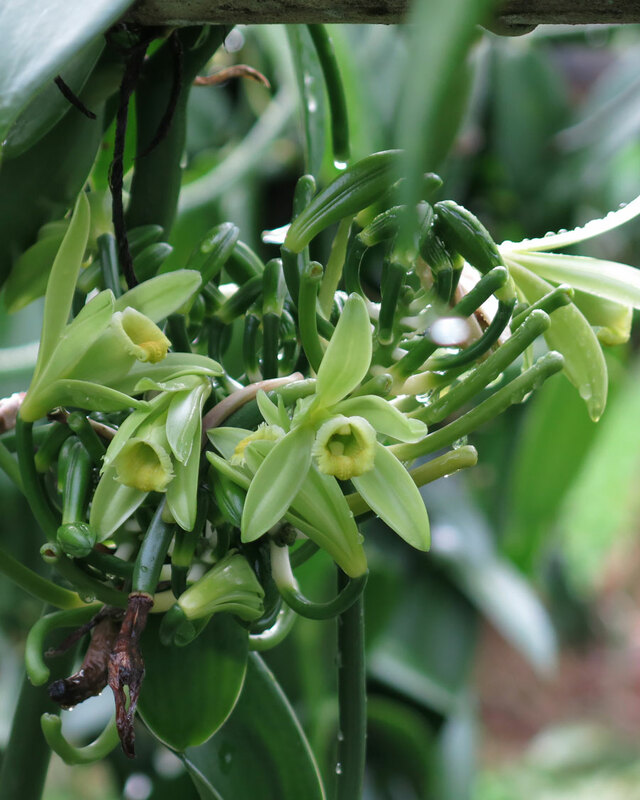 Vanilla raceme with 7 open flow­ers. This morn­ing I came across two racemes in the vanillery that had sev­en open blos­soms on each of them! This is real­ly quite unusu­al. When the vanil­la vines are real­ly grow­ing strong­ly, the flow­er­ing racemes can come out dou­ble or triple or more. Usually, the raceme is a sin­gle stalk of flow­ers with 1 — 20 flower buds on it. The buds will open usu­al­ly one at a time over a peri­od of sev­er­al weeks until they have all opened. When there is a huge amount of vital­i­ty in the vine, though, the raceme can include branch­es of racemes, mak­ing it pos­si­ble for a large num­ber of flow­ers to sprout from a sin­gle node. This is a very good thing, because each node can only pro­duce once (if at all—most don’t): and it will be either either a new vine or a flower raceme. Of course, not all the flow­ers on a raceme should be pol­li­nat­ed, it’s impor­tant to only pol­li­nate as much as will devel­op into full-size pods. Pollinate too many, and you’ll end up with a lot of use­less­ly-small pods. But with so much vital­i­ty in the vine, the num­ber of flow­ers you can pol­li­nate increas­es. We’ll prob­a­bly get 15 full-size pods on these big racemes, while a typ­i­cal raceme will usu­al­ly only pro­duce 5–7. This is one of the big racemes ear­ly in the sea­son, you can see it branch­ing at sev­er­al places. 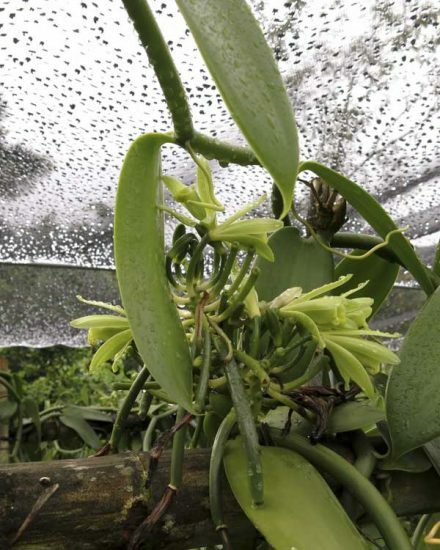 Vanilla blos­som­ing seems to come in waves: you’ll have days where the blos­som­ing is sparse, and days like today, where near­ly every raceme on all the vines has one or more flow­ers blos­som­ing. I don’t know what gov­erns these cycles, per­haps weath­er, per­haps the moon. We already know that the vines are quite sen­si­tive to lunar cycles. This morn­ing, I pol­li­nat­ed 49 flow­ers in the vanillery. An impres­sive­ly large num­ber con­sid­er­ing it’s age…this is real­ly the first year we’re hav­ing flow­ers on vines that grew in the vanillery. Perviously, all the flow­er­ing was done by vines that were a cou­ple of years old when they were trans­plant­ed in. The vanillery is final­ly com­ing in, but this is only the begin­ning. I say today is the peak of the 2016 flow­er­ing sea­son because in all, I pol­li­nat­ed 153 flow­ers today. Looking at the racemes out there now, I doubt we’ll have as big a day again this sea­son. All the racemes that are going to emerge have done so by now. Flowering took place sev­er­al weeks lat­er this year than last year. Not sure why, but there is a strong pos­si­bil­i­ty it is due to a very dry win­ter here. Meteorologists are call­ing it a drought, although it wouldn’t resem­ble what most of the world calls such a thing. Last week, the rains returned, lucky us, and spring weath­er is back to it’s sog­gy nor­mal here. For us, these flow­ers mark the begin­ning of typ­i­cal­ly eight weeks of ear­ly-morn­ing trips to the vines to do the pol­li­na­tion. 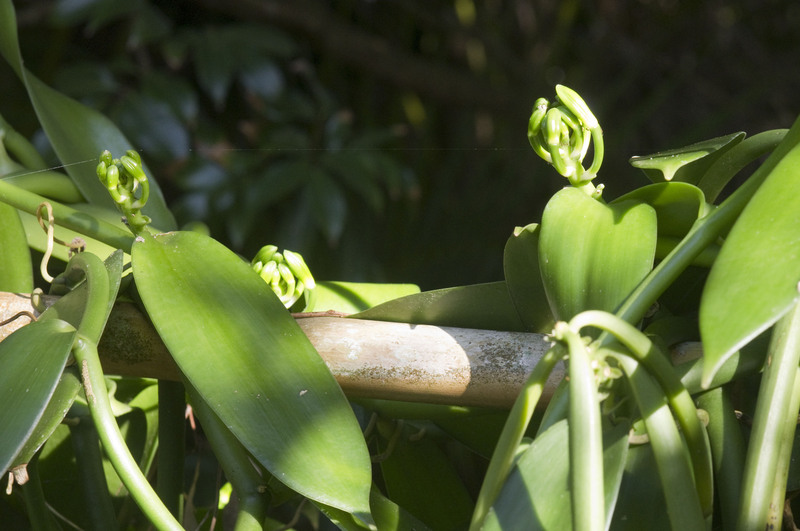 Flowering in the vanillery was slow to get start­ed, but it looks like it’s going to be good. This is the first year we expect to get a decent har­vest out of it, and it’s going get bet­ter every year for sev­er­al years. It occurred to me today that count­ing new shoots might be a good way to mon­i­tor the flow­er­ing poten­tial of the vanillery. I was inspect­ing the vines and think­ing about ways to quan­ti­fy the suc­cess of each plant­i­ng. For each cut­ting we plant­ed, most sprout­ed one new shoot, a few more than one. Enough time has passed so that some of the orig­i­nal new shoots have thrown off new shoots them­selves. 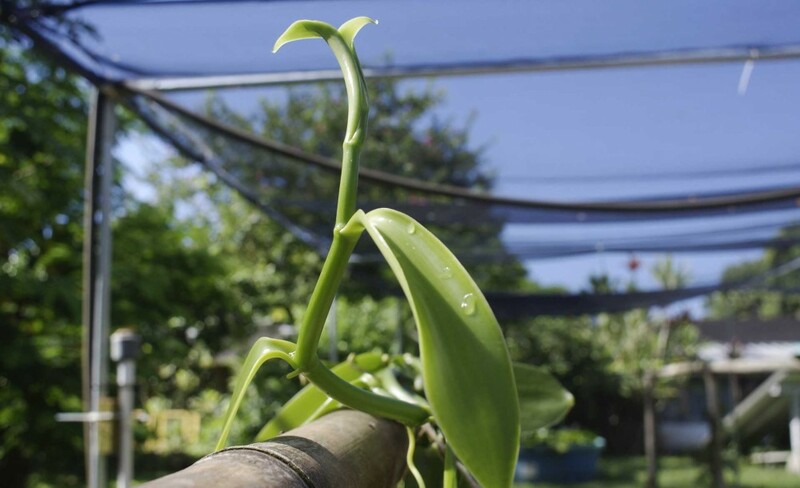 Since each node of the vanil­la plant can either grow a new shoot or flower once (if at all), it is nec­es­sary to keep the vines con­stant­ly grow­ing. Maintaining a good num­ber of grow­ing tips means more poten­tial flow­er­ing loca­tions for the next sea­son. First year vines are smooth and soft to the touch, espe­cial­ly the grow­ing tip, which is quite soft and ten­der. As the vines age, they get dark­er, hard­er and end up being quite stur­dy with a dull, waxy sheen. In the first year, the vines are going for dis­tance, tend­ing to climb as high as pos­si­ble with­out wast­ing ener­gy on side shoots. 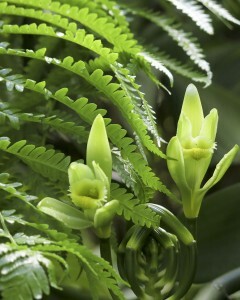 In the sec­ond or third sea­son, the mature nodes are like­ly to branch or flower if there is suf­fi­cient vital­i­ty. In march of 2015, I count­ed 38 grow­ing tips in the vanillery. 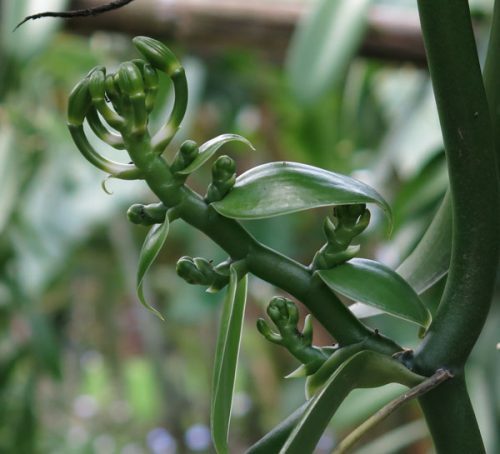 While the first vanil­la pods of the sea­son are com­ing in, the first flower buds are also appear­ing. Some of these spurts of new growth will result in new vines, branch­ing off of the mature vines, but most of these will form the flow­er­ing racemes. The ear­ly spring is when a lot of new growth occurs, and the vanil­la farmer (me) watch­es with some appre­hen­sion as the flow­er­ing racemes appear (or not!) deter­min­ing the size of the new season’s crop. In a week or so, the morn­ing rit­u­al of the hand pol­li­na­tion will begin. The flow­er­ing sea­son of 2014 was light for us, sev­er­al areas nev­er went to flower, so the 2015 har­vest sea­son will be small. One of the things we’ve learned about vanil­la is that while it will grow lush and green in the shade, it requires part sun to come to flower. As the for­est grows around the vines, they can end up in shade too deep to flower. This year, I cleared branch­es above and around the for­est trel­lis­es to let more light in. We’re hop­ing for a bet­ter flow­er­ing sea­son this year, and indeed it’s start­ing strong­ly. Last year, I noticed a cou­ple of very small vanil­la shoots in the bed under one of my vanil­la trel­lis­es. Looking clos­er, I real­ized that these were clear­ly the almost mirac­u­lous appear­ance of vanil­la seedlings! I tried sev­er­al inter­net search­es to find out: was this com­mon, had oth­er vanil­la grow­ers report­ed this? I found no reports, noth­ing about find­ing or suc­cess­ful­ly pro­duc­ing a vanil­la seedling or that a vanil­la seed had ger­mi­nat­ed nat­u­ral­ly. All I found was that it could be done arti­fi­cial­ly using a gen­er­al tech­nique for start­ing orchid seeds called “flask­ing,” which is basi­cal­ly cre­at­ing ster­ile con­di­tions for an orchid seed to grow. 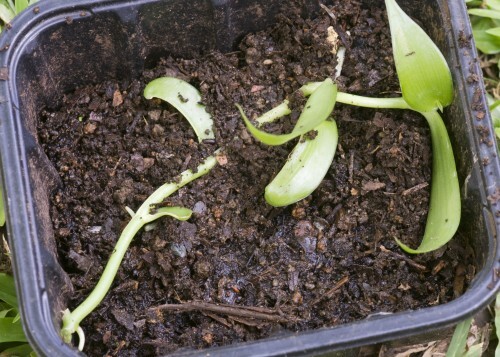 And yet, here they were, 3 vanil­la seedlings that had start­ed spon­ta­neous­ly in the mulch under some of my vanil­la plants. The one in the pho­to­graph here is the only one that was eas­i­ly pho­tographed, the rest were grow­ing up a wood­en trel­lis, too crowd­ed in by oth­er vanil­la vines to be clear­ly seen. You can see that there is some dam­age to the stem near the ground, looks like some kind of nib­bling crea­ture got to it. Since it had rootlets devel­op­ing, I decid­ed to cut it and move it into the nurs­ery where it could con­tin­ue to grow. I would guess that a big part of the rea­son this isn’t report­ed is that typ­i­cal vanil­la cul­ture doesn’t sup­port allow­ing the nat­ur­al seed­ing process to occur. 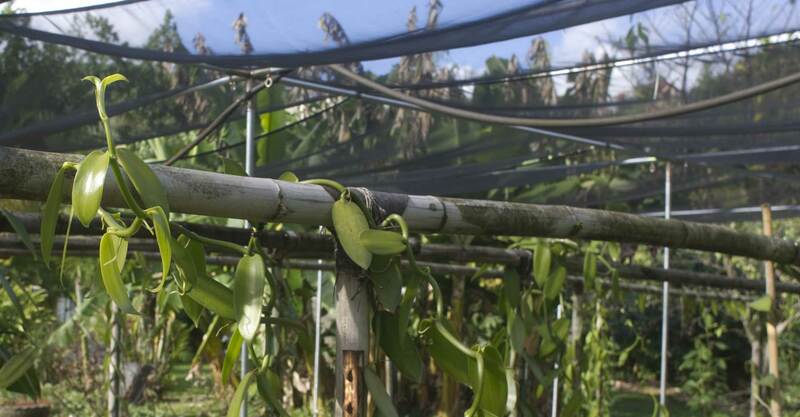 Vanilla pods (I don’t like call­ing them “beans” for some rea­son) are most­ly har­vest­ed before they are botan­i­cal­ly ripe because pods that have ripened and begun to open are of a low­er grade. In any case, all the pods are har­vest­ed, split or not. 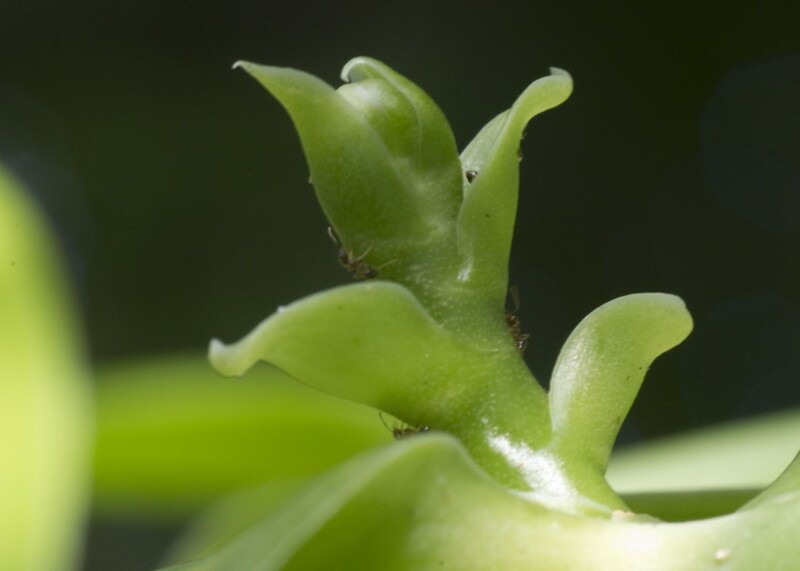 Sometimes it hap­pens that pods get over­looked and left on the vine, and I will some­times leave a pod or two on the vine if they are small and have gone too far. These pods split open, become dark brown and dry and emit a deli­cious fra­grance. Once you see this hap­pen there is no won­der­ing how vanil­la as a scent and fla­vor­ing was dis­cov­ered! 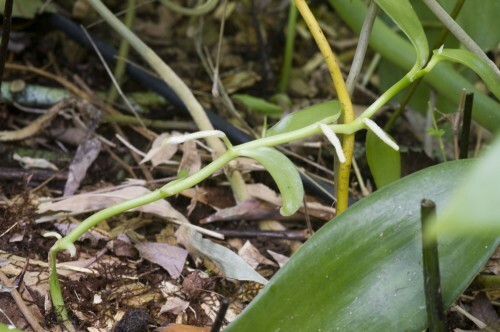 The aro­ma is strong and eas­i­ly detect­ed sev­er­al yards away from the plant. As a hob­by­ist, I plant­ed vanil­la in the gar­den under trees on trel­lis­es, leav­ing the ground and sur­round­ings alone. 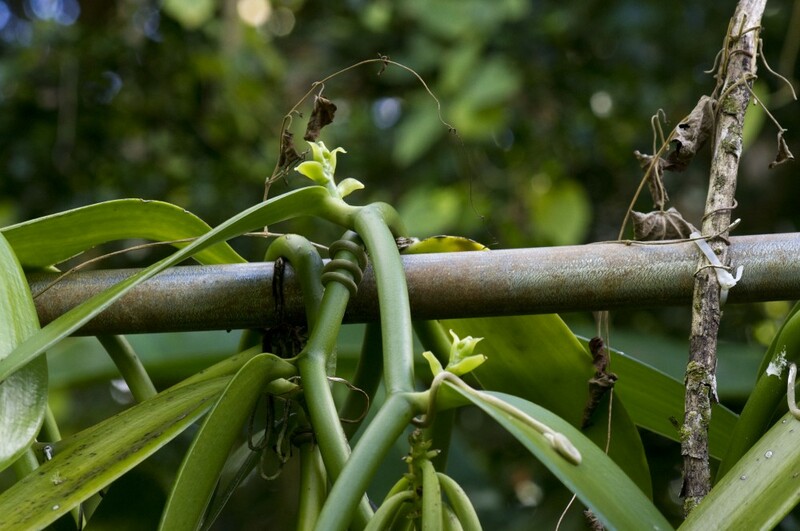 Vanilla is a for­est plant, it wants pro­tec­tion from wind and sun, a lot of humid­i­ty, and a deep bed of mulch and humus in which to spread it’s roots. I like to think that the envi­ron­ment around and under my vanil­la trel­lis­es is com­plete­ly nat­ur­al to the species, and there­fore a viable loca­tion for seedling devel­op­ment. It seems the vanil­la plants agree. 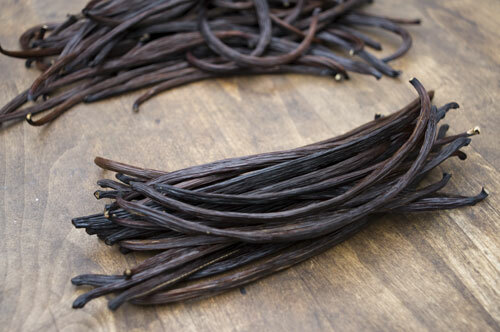 Vanilla is gen­er­al­ly prop­a­gat­ed veg­e­ta­tive­ly, it’s rel­a­tive­ly easy and the result­ing plant can be pro­duc­tive in the sec­ond year, occa­sion­al­ly the first. There is real­ly no rea­son to do it oth­er­wise, vanil­la grows rapid­ly so there is always plen­ty of mate­r­i­al to take cut­tings from. I sup­pose that there are vanil­la breed­ers out there that are work­ing with cross­es to see if oth­er char­ac­ter­is­tics could be devel­oped, but most vanil­la grow­ers aren’t so con­cerned with things like vari­ety and genet­ics. There is almost no dis­cus­sion of vanil­la genet­ics on the web, it seems to be a rel­a­tive­ly unin­ves­ti­gat­ed sub­ject as far as I can tell. I won­der what that says about the genet­ic diver­si­ty of vanil­la as cul­ti­vat­ed world­wide? 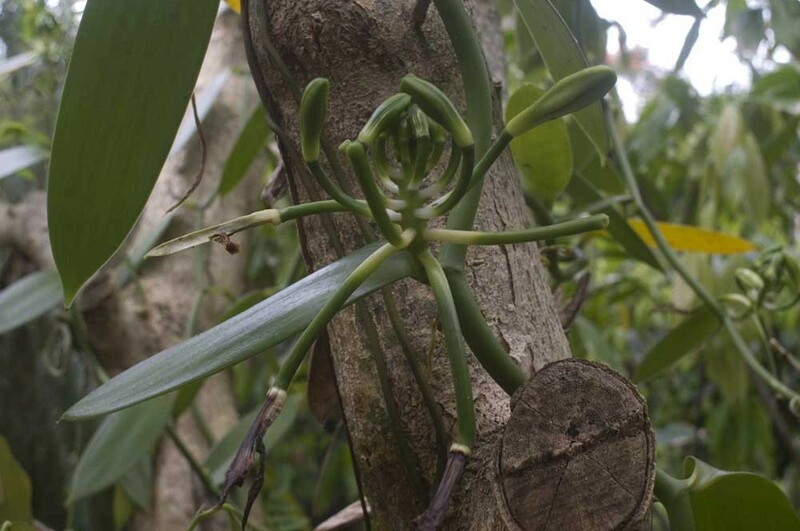 There are two species of culi­nary vanil­la, but well over a hun­dred species in the Vanilla genus, so the poten­tial for hybridiza­tion is con­sid­er­able. 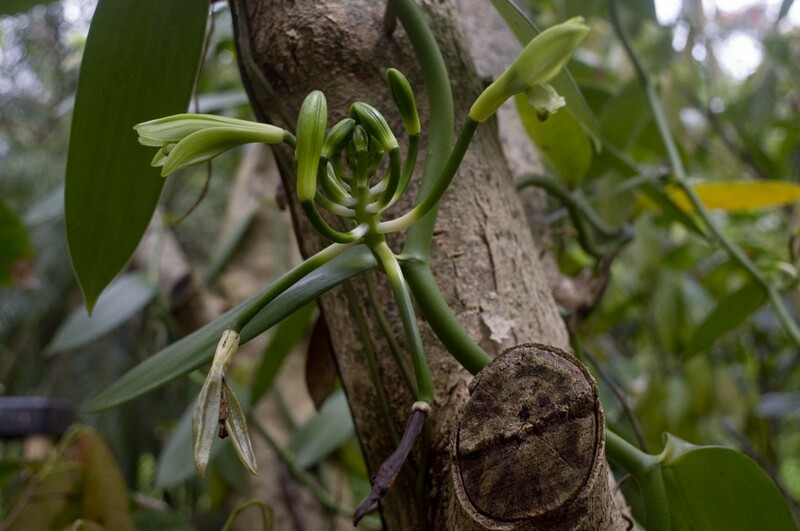 Vanilla orchids in gen­er­al have been shown to be capa­ble of hybridiz­ing, but despite it’s impor­tance, Vanilla plan­i­fo­lia (the main vanil­la of com­merce) has not been hybridized for the pur­pose of agri­cul­ture, at least not as far as I have been able to find. 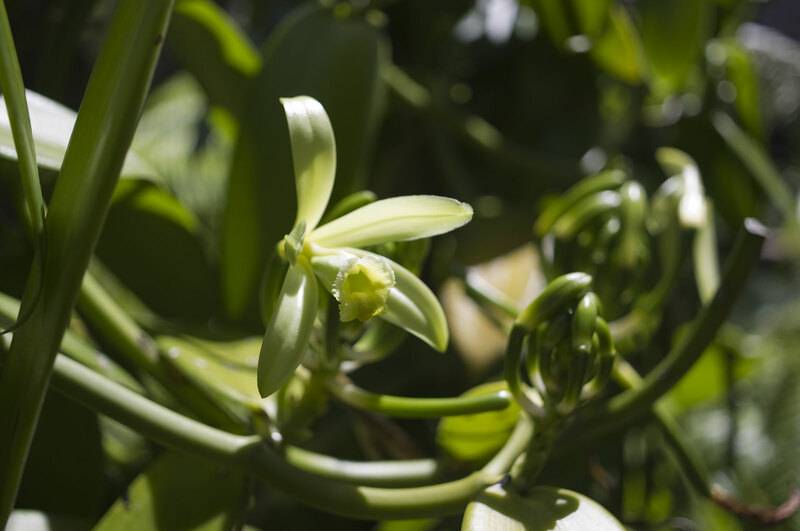 Vanilla x tahiten­sis (Tahitian vanil­la) is a hybrid of Vanilla plan­i­fo­lia and Vanilla odor­a­ta, but it’s not known how that came about. The ori­gins of Tahitian vanil­la are a bit of a mys­tery, but the cross could have occurred nat­u­ral­ly as these species share sim­i­lar regions. This doesn’t shed light on the genet­ics with­in the species, how­ev­er. Are there local vari­ants of vanil­la in it’s nat­ur­al range (Mexico, Central America and the Caribbean)? Probably, but I haven’t come across any dis­cus­sion of this sub­ject. 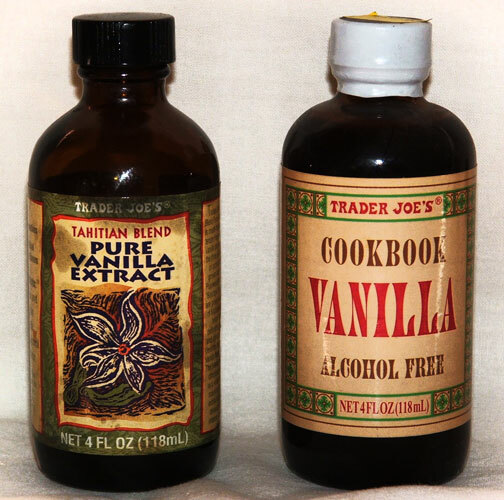 What I do know is that even when a flower self-pol­li­nates (as Vanilla often does) there will be some nat­ur­al genet­ic vari­a­tion. This means that the seedling vines I have here are going to be slight­ly dif­fer­ent from the par­ent vines. I’ll be watch­ing the vine that I have trans­plant­ed for any dis­cern­able dif­fer­ences, and report my find­ings here if any­thing inter­est­ing is not­ed. Today we’re rolling out our first prod­ucts for sale! Over the years, we’ve sold these beans through friends, at local farmer’s mar­kets and to local culi­nary pro­fes­sion­als, and though we always intend­ed to make our beans wide­ly avail­able, we always seemed to be too busy to make that hap­pen. Well, now it’s time to offer our unique prod­uct to every­one on the inter­net. 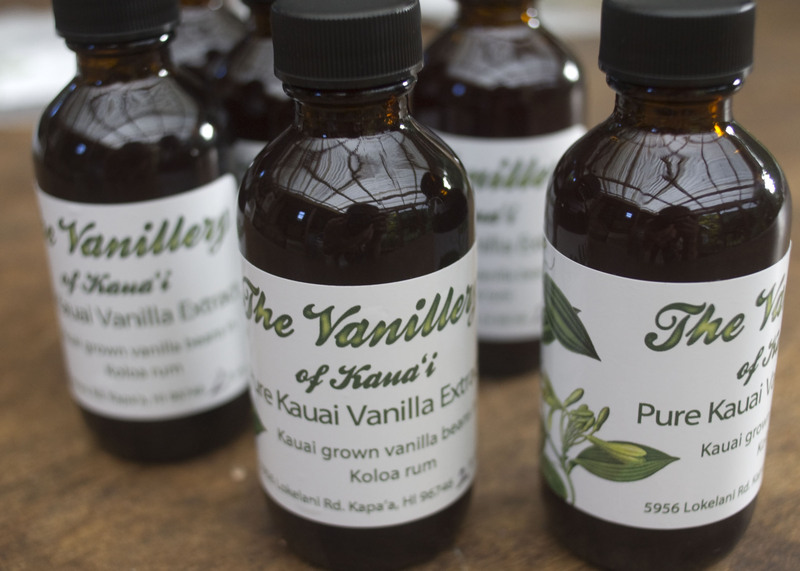 Our first offer­ings will be very sim­ple: Grade A and Grade B whole vanil­la beans and 2-ounce bot­tles of our home­made Kauaʻi rum vanil­la extract. Anyone inter­est­ed in cui­sine who has poked around the Internet has learned that there is a stag­ger­ing­ly huge num­ber of food blogs out there! I’m cer­tain­ly in favor of it in gen­er­al, it’s made infor­ma­tion about foods and their prepa­ra­tion acces­si­ble. You can type in the name of an ingre­di­ent or prepa­ra­tion and get an ency­clo­pe­dia of infor­ma­tion and opinions…not to men­tion pho­tog­ra­phy rang­ing from too-beau­ti­ful to “what were they think­ing?” but you can learn a lot. I cer­tain­ly do. After the area is cleared and smoothed out, the weed­block and card­board are laid down. The frame is assem­bled from EMT and weld­ed con­nec­tors. The 50% shade cloth is attached to the top of the frame, and the rows are mound­ed with com­post­ed tree chips. 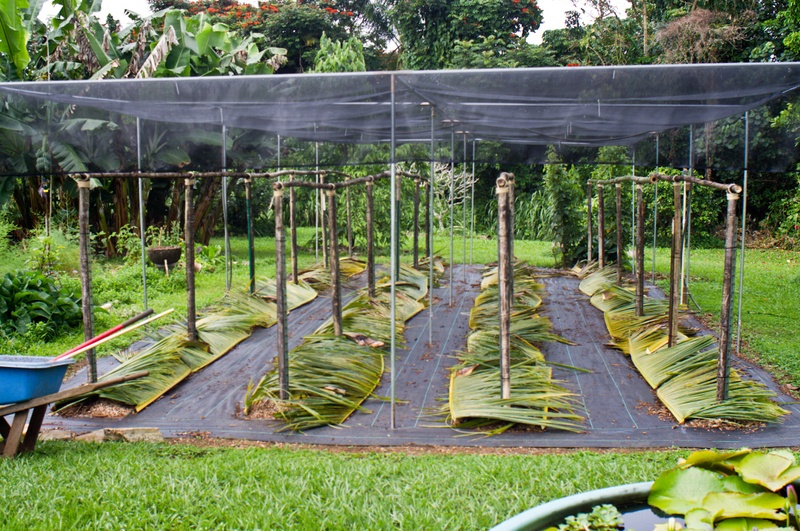 The rows are top-mulched with coconut fronds to keep them cool and moist. Importantly, it also dis­cour­ages the fer­al chick­ens from brows­ing. A bam­boo trel­lis is built, using steel t-posts to secure the uprights. The vanillery is a semi-enclosed shad­ed space. 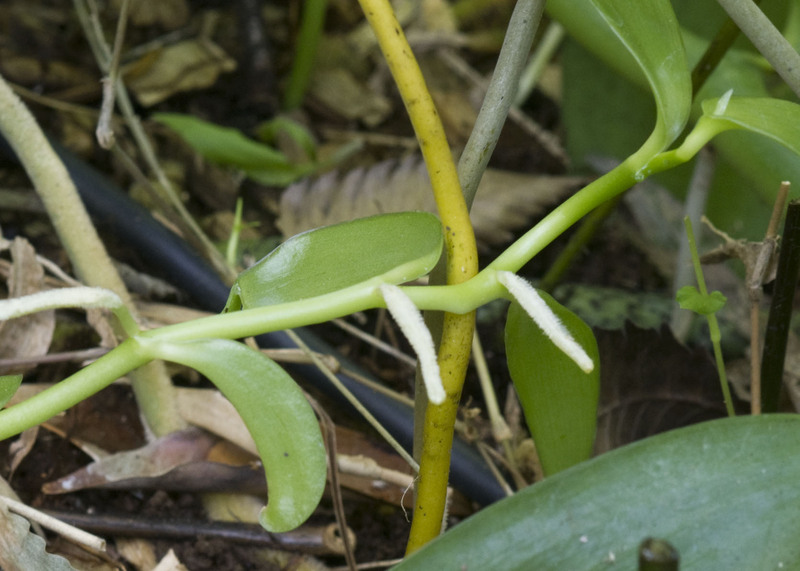 The vanil­la cut­tings are laid with their root­ing ends in the mulch. The grow­ing tips of the cut­tings are tied to the uprights. The vines attach them­selves to the bam­boo and begin climb­ing up. Roland and Lisa open the vanillery. May the vines grow abun­dant!